Former three-time heavyweight champion boxer Muhammad Ali has been taken to hospital with a mild case of pneumonia, his spokesman says. Ali, who suffers from Parkinson's disease, is in a stable condition, Bob Gunnell told media. "The prognosis is good," Mr Gunnell added, saying the 72-year-old's stay in hospital was likely to be brief. He gave no other details and asked that the privacy of Ali's family be respected. Ali was diagnosed with Parkinson's in 1984, three years after his retirement from boxing. 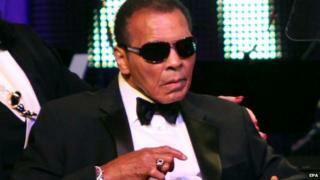 He appeared in public at a ceremony in September in his hometown of Louisville for the Muhammad Ali Humanitarian Awards.